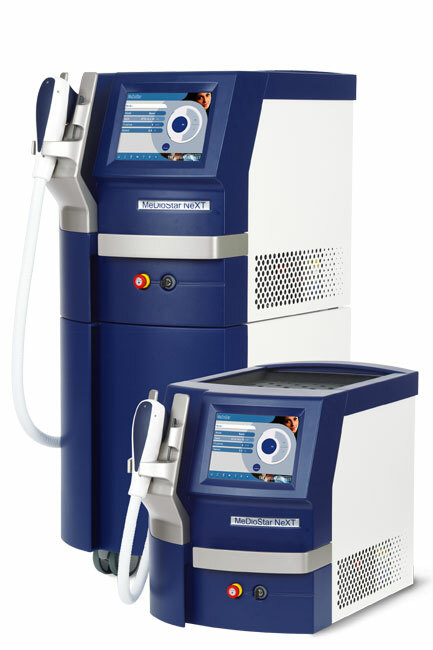 The High Power Diode Laser is able to achieve great results thanks to a light procedure that allows thermal dermal damage to be controlled. Hence leading to subsequent collagen remodeling while preserving the epidermis. The rejuvenation laser treatment improves skin damage leading to a regeneration of the skin structure (skin tightening, reduction in pore size), brightening of pigmentation and reduction in small wrinkles. The process requires three treatments one month apart. The parallel bipolar Radiofrequency (RF) can effectively diminish or eliminate wrinkles and sagging skin. The high frequency radio waves selectively heat the tissue while cooling the epidermis. The handpiece lifts the treated skin area without damaging the surrounding tissue. The skin surface is cooled by the handpiece and the connective tissue is slightly heated by the high-frequency RF current. This causes the contraction and lifting of collagen. Simultaneously, the new production of collagen is stimulated and has an additional lifting effect after a few weeks. Firmer skin and minor wrinkles are the result. The radio frequency method is extremely gentle; you can continue with your daily routine immediately following treatment. This treatment is suitable for wrinkles anywhere on the face – crow’s feet, wrinkles on the forehead, on cheeks or around the mouth. It is also effective in smoothing the neck and décolletage area. Radio frequency treatment also effectively tones flabby skin on the upper arms, stomach, buttocks and thighs. This method ensures risk-free, painless treatment. Ideal results require four to eight treatments, several weeks apart. This treatment has been conducted using touch-free technology so there is no risk of skin burning (as may happen with other lasers.) Both you and the operator will wear protective glasses to keep your eyes safe from the bright flashes of the laser’s light. You will feel heat on the area that has been treated, but this would be the only sensation during the whole session. The radio frequency method is extremely gentle; you can continue with your daily routine immediately following treatment. This treatment is suitable for wrinkles anywhere on the face – crow’s feet, wrinkles on the forehead, on cheeks or around the mouth. It is also effective in smoothing the neck and décolletage area. Radio frequency treatment also effectively tones flabby skin on the upper arms, stomach, buttocks and thighs. This method ensures risk-free, painless treatment. The number of treatments differs from person to person, however treatments are typically administered every 3-5 weeks until the course is completeMediostar Next™ is considered a gold standard in laser skin rejuvenating due to the degree of the skin improvement. Rejuvenation treatments can be performed on the face, neck and chest. A course of 4 – 6 would be adviseable.